Day four of the Lotus Yoga Off The Mat Challenge theme is yoga with friends. Maybe a friend introduced you to yoga, or maybe you brought a friend to yoga class. Or perhaps your yoga practice was instrumental in discovering a new find. 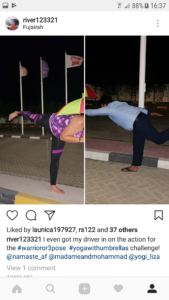 What is your idea about the connection of yoga and friends? Currently I’m living and working in the United Arab Emirates. There are no yoga classes in my area, so I’ve got to improvise. I do my best to practice on my own, but sometimes I really crave the camaraderie and comfort of a community. I’ve been blessed with a wonderful driver, Zaheer. This young, Pakistani man has a heart of gold and he shares it generously with me. He takes me shopping and does the haggling on my behalf; he runs errands for me like dropping off and picking up my Abayas at the cleaners, post office runs, grocery shopping, and he even does yoga with me! You see, one day I was lamenting in the car that I really didn’t want to do yoga alone that day. “I’ll do it with you,” he offered. I thought he was joking, but he wasn’t! He followed me into my apartment and got the mats out on the floor while I set up my computer and the speakers. After a few giggles, we turned on a video and got started. 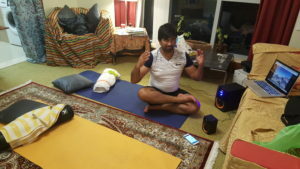 It was his first time to try yoga, but lucky for both of us, he’s hooked now! I’d love to hear your stories of yoga with friends!